37501 Teesside Steelmaker approaches Wychnor Junction on 23 October 1989 with the 6M01 Lackenby to Wolverhampton steel train. Spending just short of a decade as 37501, this loco entered service in 1961 as D6705, acquired the number 37005 with the introduction of TOPS, and finished up as 37601. The very poor lighting here required the use of the long defunct Kodachrome 200 film, which despite being very grainy and prone to odd colour shifts was virtually as sharp as its slower stalemates, and the only fast 35mm film that I found to be of any practical use. 37506 British Steel Skinningrove & 37512 Thornaby Demon have just crossed over the River Wear, as they emerge from the trees near Frosterley on 10 April 1993 with the late running Pathfinder Tours 1Z43 04:50 Swindon to Eastgate 'Weardale Explorer' railtour. This was the final train over the line, Lafarge having closed the Eastgate Cement Works the previous month. The line has since reopened as a heritage railway. 37509 & 37413 Loch Eil Outward Bound pass Ashley on a slightly hazy 20 July 1996 with the 7F48 07:30 Tunstead to Oakleigh stone train. Close inspection of the original 6x7 slide reveals that the numerous local rabbits in the recently mown hay field on the right are taking absolutely no notice of all the noise going on just behind them! A working that saw hundreds of railway photographers descend on the Midland Mainline on 21 April 2010 was the 6Z90 08:37 Tyne Dock to Sheerness scrap train. A good percentage of them seemed to be at this location! The prospect of a pair of 37s on a real freight train in the sun was too good to miss. Although the lineside clutter is hardly photogenic, this is one of the few locations on the southern end of the route where the sun would still be on the nose at the required time. 37510 & 37667 prepare to weave across onto the bi-directional freight line at Harrowden Junction. At this point they were running a few minutes early, however, this was not to last, as signaling problems further south brought the train to a stand at Bedford. 37512 Thornaby Demon holds up the traffic at Askern on 10 July 1994, as it heads north with steel empties. A grab shot whilst waiting for 56135 & 56068 on the Pathfinder Tours 'Donny Deviator' railtour. Built in 1961 as D6722, the loco is still active on the mainline today (as 37608), the red Vauxhall Nova waiting at the barrier has not been so durable! 37513 passes Potbridge in the drizzle on 26 April 1997 with the 6M73 09:12 Quidhampton to Willesden, conveying a single calcium carbonate tank. This would often be a short train, but I was a bit disappointed at the time to see just a single wagon, although with hindsight, it does present quite a comical picture. 37513 & 37713 pass Haddiscoe on 21 August 1999 with the A1A Charters 1Z42 09:03 Kings Cross to Lowestoft 'A Farewell 11 Arms' railtour, which they had taken over from 31110 & 31154 at Norwich. The train is running beside the New Cut, an artificial channel constructed in the nineteenth century to connect the River Yare and Waveney. 37514 & 37517 pass Badgeworth on 28 September 1989 with the 6E47 11:00 Cardiff Tidal to Tees Yard steel empties. This was booked to be hauled by a pair of Thornaby allocated 37/5s, but for some reason I didn't take that many pictures of the working. A matching pair of red stripe liveried locos, complete with Thornaby kingfisher logos, makes up for the very poor light, and consequent poor quality Kodachrome 200 image. 37514 climbs the gradient between Hall Lane Junction (just visible behind the rear of the train) and Seymour Junction, at Staveley on 6 March 1993 with the Pathfinder Tours 1Z39 06:05 Manchester Piccadilly to Bentley Colliery 'Coker Coaler' railtour. 37422 can just be seen on the rear of the train. This section of line is now disused. 37514 slowly manoeuvres the Pathfinder Tours 1Z39 06:05 Manchester Piccadilly to Bentley Colliery 'Coker Coaler' railtour underneath the bunker at Harworth Colliery on 6 March 1993. The lead locomotive, 37422, had travelled right underneath the bunker. Bentley Colliery, pictured on 6 March 1993. The Pathfinder Tours 1Z39 06:05 Manchester Piccadilly to Bentley Colliery 'Coker Coaler' railtour has just arrived behind 37422, and 37514 waits to take the train back out again. The colliery closed later in the year, and was demolished shortly afterwards. This whole area has now been returned to nature, and soon there will be very little evidence that the mine ever existed. 37516 catches a very brief patch of sunshine, as it approaches Barton-under-Needwood on 26 June 1991 with the 6E52 08:26 Wolverhampton to Scunthorpe steel empties. This view has now changed completely. In 1991 it was still mainly rural (apart from the pylon!). Since then however, the small trackside farm, known as Fatholme, has been demolished, and the whole area is now covered by the huge Central Rivers Voyager maintenance depot. Unusual traction for the Venice Simplon Orient Express. Unbranded Loadhaul liveried 37516 rounds the curve on the approach to Seamer West Junction on a very dull 15 June 1997 with the Leeds to Scarborough VSOE. I doubt if any of the passengers appreciated just how unusual the choice of loco was, although ironically since its acquisition by West Coast Railways, and a repaint into sludge brown livery, it has been quite a common sight on luxury excursions. However, not so in 1997! 37516 passes Tackley in dramatic lighting on 21 May 2009 with the 5Z37 10:00 Carnforth to Eastleigh 'Queen of Scots' ECS, running a staggering 90 minutes early. This superb lighting didn't last long, with the sun disappearing into that huge encroaching mass of black cloud less than a minute after the train had passed. The 'Queen of Scots' coaching stock easily represents the most interesting and varied rake of passenger stock on the national network, with the leading three vehicles here being the most interesting. Directly behind the locomotive is the LNWR 1892 built observation saloon, followed by the superb teak finished GNR family saloon (1912), behind which is LNWR 1891 built dining car. 37516 & 37676 Loch Rannoch pass Damery on 23 June 2012 with the Spitfire Railtours 1Z37 05:00 Birmingham International to Penzance 'Kernow Explorer' railtour. Unfortunately the early sunshine had been replaced by dense cloud. However, if you think this looks bad, the following railtour hauled by 55022 passed in unbelievably grim conditions. Both specials were heading for Cornwall for the Mazey Day celebrations. 37517 & 37095 take the Leeds line at Church Fenton on 1 July 1995 with the Hertfordshire Railtours 1Z37 07:40 Kings Cross to Harrogate (via Newcastle) 'Cattal Grid' railtour. The line to Castleford and Knottingley is behind the sheds in the background. The obvious place to get a picture of the Hertfordshire Railtours 1Z37 'Cattal Grid' railtour on 1 July 1995 was passing through Cattal station. So here are 37517 & 37095 slowing for the token exchange at the eponymous station with what is obviously the 'Cattal' part of the tour. The 'Grid' part was the York to Newcastle and return section behind 56006. The 37s worked round the Harrogate loop, and 90020 was provided for the Kings Cross to York and return sections. 37518 & D306 cross the River Nene on the approach to Ferry Meadows with the 1E50 13:39 Wansford to Peterborough service on 1 March 2008, during the Nene Valley Railway's Diesel Gala. This head on view, necessary to show the train crossing the bridge does at least not draw attention to the patchwork of primer on the side of 37518! The bridge in the distance is Mill Lane, Castor. 37518 makes a good old racket as it climbs the bank at Heap Bridge on 3 July 2011 with the 2J64 10:06 Rawtenstall to Heywood service, during the East Lancashire Railway's Diesel Gala. It certainly looks good in the classic Railfreight red stripe livery, and certainly a lot better than when I last saw it on the Nene Valley Railway! 37518 crosses the M66 motorway at Heap Bridge on 3 July 2011 as it works the 2J71 11:15 Heywood to Rawtenstall service, during the East Lancashire Railway's Diesel Gala. Although this was only a last minute decision to take this picture, I think the composition works really well. The unexpected sight of a Class 37 above the road traffic makes for an interesting picture, although a few less lamp posts in the foreground would have improved things! Under a leaden sky, 37521 runs wrong line though Craven Arms station on 27 May 1996 with the diverted 6Z92 05:40 Llanwern to Margam steel coils. The loco has just round its tiny load, and would shortly be branching off for its circuitous detour via the Central Wales line. Bank Holiday engineering works had closed the South Wales mainline, but it hardly seemed worth the massive detour for just six steel coils! 37521 emerges from Llangunllo Tunnel on 27 May 1996 with the diverted 6Z92 05:40 Llanwern to Margam steel coils. Normally this would not be considered a very good viewpoint, as the head on angle obscures the train. In this however, there isn't much train to obscure, being just three wagons, containing six steel coils! 37521 passes Crossway (near Llandrindod Wells) on 27 May 1996 with the 6Z92 05:40 Llanwern to Margam steel coils. This was diverted from the South Wales mainline due to engineering works. The train's sedate progress over the Central Wales line allowed several pictures to be taken. 37521 approaches Llanwrda station, on the Central Wales Line with the very lightly loaded diverted 6Z92 05:40 Llanwern to Margam (via Craven Arms) steel coils on 27 May 1996. Despite the miniscule load, it was obviously felt worthwhile to run this train via such a massive detour. The short direct route was closed for Bank Holiday engineering works. Llanwrda had a passing loop until 1965, but since then all trains use the former northbound platform. This picture is taken from the disused former southbound platform. 37521 English China Clays & 37682 Hartlepool Pipe Mill pass Bolton Percy on 6 April 2002 with the Pathfinder Tours 1Z40 07:22 Crewe to Scarborough 'Napier Navigator' railtour. The highlight of this tour, as the name suggests, was the unprecedented sight of D9016 Gordon Highlander in Porterbrook livery! Viewed from next to the Sidings Restaurant, Shipton by Beningbrough, 37521 English China Clays & 37669 head north through the gloom and drizzle on 14 February 2004 with the Pathfinder Tours 1Z37 13:25 York to York 'Tyneside Valentine' railtour. This was a mini tour utilising the stock which 47635 had brought up from Cardiff earlier in the day. 37521 passes Cassington on 29 November 2018 with the 1Z23 07:13 Bristol High Level Siding to Tyseley Network Rail test train. 37116 is bringing up the rear. This was running 12 minutes early, as it didn't have to wait for the 5Z12 11:35 Long Marston to Reading Traincare Depot DMU ECS, as that was, as usual, cancelled. I chose this location as the overhanging tree on the right adds to the composition, and if the sun had come out (it did a few minutes after the train had passed! ), a picture, albeit backlit, would still be possible. 37601 gets to grips with the 1 in 30 gradient as it climbs away from Folkestone Harbour with the Pathfinder Tours 1Z88 14:00 Folkestone Harbour to Dungeness 'Atomic Harbour Master' railtour on 20 October 2007, by this time running an hour late. The noise was awesome as the train slowly ascended the steepest gradient on the Railtrack system. Even more noise was generated after the train stopped a little further up the bank and then obviously had to restart on the gradient. 37603 was also providing full power at the rear. Note the odd layout of the tracks, as they pass between Dyke Road and the Tram Road. The sea can just be glimpsed in the distance. 37601 approaches Snargate on 20 October 2007 with the Pathfinder Tours 'Atomic Harbour Master' railtour, at this point running as the 1Z88 14:00 Folkestone Harbour to Dungeness. Out of sight on the rear of the train is 37603, which would shortly be returning the train from Dungeness. Definitely not the picture I had in mind! 37601 Class 37-'Fifty' leads the 1Q13 10:02 Didcot to Didcot via Bristol Network Rail radio survey train past Knighton on 29 September 2011. 37611 is on the rear. I had carefully chosen this viewpoint to show the autumnal teasels and brambles in the foreground. What I had not planned for was the 1L50 10:31 Cheltenham to Paddington HST putting in an appearance as the background! Running thirty minutes late after a lengthy sojourn in Ufton loop, 37601 Class 37-'Fifty' runs alongside the Kennet & Avon Canal at Crofton on 30 September 2011 with the 1Q13 10:15 Didcot to Derby RTC (via Taunton and Reading) Network Rail radio survey train. 37611 is bringing up the rear. Although an amazingly hot day for late September, there is still enough of a breeze to spoil the chance of a perfect reflection! 37601 Class 37-'Fifty' races through Ascott-under-Wychwood station on 23 March 2016 with the 1Z02 06:32 Derby RTC to Bristol Network Rail test train. 37688 Kingmoor TMD can just be seen on the rear of the train. This was a full day's outing for the vintage Type 3s, with a booked arrival time at Bristol of 23:45, after a varied route, including a trip to the seaside at Weymouth. 37601 Class 37-'Fifty' brings up the rear of the 1Z03 09:37 Bristol Temple Meads to Derby RTC Network Rail test train at Chilson 24 March 2016. 37688 Kingmoor TMD is the lead locomotive. The train would shortly come to a stand at Ascott-under-Wychwood, in order to allow the preceding HST to clear the section. Lots of English Electric noise and smoke at Ascott-under-Wychwood on 24 March 2016. 37601 Class 37-'Fifty' brings up the rear of the late running 1Z03 09:37 Bristol Temple Meads to Derby RTC Network Rail test train. The train, led by 37688 Kingmoor TMD, is accelerating away from a signal check. 37601 Class 37-'Fifty' passes through Kingham station at high speed on 26 January 2017 with the 1Z23 07:40 Bristol High Level Siding to Tyseley Network Rail test train. 37611 is bringing up the rear. Although the lighting was atrocious, I decided to make the short trip to Kingham to record this, as this recently created viewpoint (from a new footbridge) would be totally useless had the sun been out, as this would be looking directly into the sun. 37601 Perseus passes Bretforton on 11 August 2017 with the 6M95 13:02 Long Marston to Rugby Depot Access Line, conveying Robel Mobile Maintenance Train DR97808, DR97608 & DR97508. This was running 117 minutes late, having not left Long Marston at the booked 13:02, but 85 minutes later at 14:27! I had been waiting at Honeybourne, but had given up and was driving home, when just before joining the A44 after climbing the hill from Saintbury, I decided to check the phone again. As the train was now on the move, I decided to back track, and thinking that I might not get back to Honeybourne in time, decided to head for Bretforton instead. Railway photography either involves lots of hanging around, or lots of rushing around, or in this case, both! 37601 Perseus passes Honeybourne on 24 February 2018 with the 5Q94 08:55 Northampton EMD to Long Marston, conveying EMU 350253 for corrosion repairs. Given that it was a completely sunny day, and that this is one of the better locations on the route, I was surprised that there was only one other photographer here to record the event. 37601 Perseus slowly approaches Honeybourne on 24 February 2018 with the 5Q95 13:30 Long Marston to Northampton EMD, hauling EMU 350255, which has received bodywork repairs at Long Marston. The HST stop board in the foreground is a little ominous, as the 1P51 12:13 Hereford to Paddington GWR HST had arrived at the station behind my viewpoint, and could so very easily have compromised this picture. I wouldn't have minded a passing shot, but that would have been exceedingly lucky timing! In the event it didn't move until the 37 was well past the bridge. 37601 Perseus arrives at Evesham on 21 April 2018 with the 5Q94 08:45 Northampton EMD to Long Marston, conveying EMU 350262 for corrosion repairs. I was surprised to be the only person here, given that it is one of the few spots on the Cotswold Line where the sun would be fully on the nose. I was actually extremely lucky to get this in the sun at all, as after a prolonged sunny period, the sun disappeared into a massive bank of cloud just minutes before it was due. Miraculously, just as the loco passed the signal box, a small hole opened up in the cloud, giving a minute's worth of very welcome sunshine! 37601 Perseus passes Honeybourne on 5 May 2018 with the 5Q94 08:55 Northampton EMD to Long Marston, hauling EMU 350234 for corrosion repairs. This makes an interesting comparison with the same train, with the same locomotive, pictured here a couple of months earlier. The buddleia forest in the foreground has been completely removed, although I expect it will soon be back! 37601 Perseus slowly departs Long Marston on 5 May 2018 with the 5Q95 13:30 Long Marston to Northampton EMD, conveying EMU 350260, which had received attention to body corrosion. The fact that this was only cloudy bright, rather than full sun, was not too much of a problem, as sunny midday pictures at this time of year do not look good, owing to the very high sun angle. 37601 Perseus runs through the tunnel of trees that now marks the approach to Norton Junction, as it prepares to branch off onto the Cotswold Line with the 5Q94 08:55 Northampton EMD to Long Marston on 2 June 2018. It is hauling EMU 350266. 37601 Perseus passes Norton on 7 July 2018 with the 5Q95 15:59 Long Marston to Northampton EMD, conveying EMU 350264, which had received body corrosion repairs. In the event this would only travel another couple of miles, as the loco failed at Worcester. 37884 collected it the following day, and the pair then completed the journey. I was exceedingly lucky to get this in the sun, as not only was it cloudy in the background, but it was much the same just behind me. A very fortunate small gap had opened up in the large black cloud that I felt sure was going to ruin the picture. 37602 rounds the curve at Crofton on 21 July 2006 with the 1A94 10:15 Plymouth to Paddington Network Rail test train, deputising for the New Measurement Train HST. 37606 is on the rear. Unfortunately the outwards run (1C79 05:52 Paddington to Plymouth) was in thick fog. The earlier sunshine had disappeared by the time the 1Z14 09:45 Derby Railway Technical Centre to Worcester Shrub Hill (via Oxford) Ultrasonic Test Train returned from its reversal at Oxford on 11 September 2006. 37602 is pictured here approaching Whitehill Bridge on the Cotswold Line, between Combe and Finstock. 37605 can just be seen on the rear of the train. This is yet another location on this line that has become very overgrown in the last few years. Although this short train neatly fits in the gap, previously there was an uninterrupted view to the lofty Grintleyhill Bridge, a mile distant. 37602 passes the site of Challow station with the 1Z14 10:00 Westbury to Derby Serco test train on 12 October 2006. This train was originally booked to do 05:35 Westbury to Weymouth, but a last minute change of plan saw it heading home via Swindon and Oxford instead. 37611 was on the rear of the train. This is the start of the four track section to Wantage Road, the loops being reinstated in the mid 1990s, to add capacity for the Avonmouth to Didcot Power Station coal trains. 37602 & 37069 approach Oxford with the Spitfire Railtours 1Z44 06:49 Crewe to Weymouth 'Wessexman' railtour on 23 May 2009. Even though the tour was running a couple of minutes late, the 11 minute booked stop at Oxford was not taken. Although a gloriously sunny morning, the first signs of clouds can be seen in the background, which would cause problems later in the day. 37602 heads along the down relief line at Denchworth on 17 August 2009 with the 1Z12 08:57 Derby to Bristol Temple Meads (via Oxford and Newport) Network Rail radio survey test train. 37218 is on the rear of the train, partly hidden by the signal gantry. Running twenty minutes early at this point, it was presumably going to combine the two short layovers in the loops at Steventon and Challow into one long wait at Challow! 37602 passes Baulking in a lucky patch of sun on 17 August 2009 with the 1Z12 08:57 Derby to Bristol Temple Meads (via Oxford and Newport) Network Rail radio survey test train. 37218 can be seen on the rear of the train. Having already seen the train at Denchworth, there was plenty of time for this second shot, as it waited in Challow loop for 45 minutes. 37602 & 37607 pass Dalrigh on 24 June 2013 with the Compass Tours 1Z34 16:05 Oban to Crewe 'Oban & Lorn Highlander' railtour. My chosen location at Dalrigh proved to be slightly bushed up, so as I could see this spot in the distance, I relocated to what appears to be a very little visited viewpoint, which is hardly surprising considering it is a very long walk from the nearest road! Beinn Dorain and Beinn Odhar dominate the background. The Crianlarich to Fort William line follows the lower edge of the forest in the background. 37602 & 37605 pass Somerton on 28 November 2015 with the Pathfinder Tours 1Z47 06:18 Derby to Chichester 'Jolly Marketeer' railtour. Unfortuntley the early morning sunshine was already rapidly fading out into high cloud. In the foreground work is underway to install (according to the locals) an auxiliary generator, in case of power failure at the nearby occupation crossing. Running over two hours early, 37602 & 37605 pass Fiddington on 8 March 2016 with the 6M56 13:41 (11:30 actual) Berkeley to Crewe nuclear flask. This early running was excellent news for me, as I was at this location for 56098, which had just passed by with the 6Z34 09:46 Cardiff Tidal to Chaddesden scrap empties. Note the tractor in the background crossing Tredington level crossing. 37603 & 37601 make easy (but noisy!) work of the 1 in 37 Lickey Incline on 13 July 1996 with the Pathfinder Tours 1Z37 07:24 Bristol Temple Meads to Doncaster 'Yorkshire Doodle Dandy' railtour. The perfect combination of a clean pair of 37s and excellent lighting complete with dark clouds in the background. As was fairly common in those days this was a multi traction tour with Classes 31, 56, 58 & 60 being employed at some stage during the day. 37603 & 37604 pass Aynho Junction in the rain with the Pathfinder Tours 1Z37 05:26 Southampton to York 'Ouse-Humberman' railtour on 7 May 2007. 47805, which had headed the tour as far as Didcot, can just be seen on the rear of the train. The signal on the left controls Aynho Junction, where the line to Marylebone via Bicester diverges from the Oxford line. 37603 & 37604 pass Cropredy in the rain with the Pathfinder Tours 1Z37 05:26 Southampton to York 'Ouse-Humberman' railtour on 7 May 2007. I had seen this train just a little while earlier at Aynho Junction, but as this was on my route north anyway, I went for another picture, despite the gloomy weather. 37603 & 37604 pass the site of Ackworth station (between Moorthorpe and Pontefract) with the Pathfinder Tours 1Z37 05:26 Southampton to York 'Ouse-Humberman' railtour on 7 May 2007. 47805 can just be seen on the rear of the train. The former goods shed is in the process of being converted into a house. Note the steep incline that the train has just descended which can be glimpsed through the bushes between the goods shed and the bungalow. 37603 & 37604 speed through Church Fenton with the Pathfinder Tours 1Z39 17:04 York to Southampton 'Ouse-Humberman' railtour on 7 May 2007. Typically, a few minutes later, as I was driving away the sun came out! On their final day in traffic before being sold to DRS, 37603 & 37601 worked the Pathfinder Tours 'Atomic Harbour Master' railtour from Crewe to Folkestone Harbour on 20 October 2007. They are pictured here passing Great Chart (near Ashford) with the 1Z87 09:45 Euston to Folkestone Harbour section of the tour. Although the day started sunny, and was clear again in the afternoon, around midday there was a lot of cloud in Kent, which meant that many photographers didn't get the pair of 37s in the sun, so I was very lucky with this one. The locos were split at Ashford to work the two branches in top'n'tail mode, and there was no chance of a picture later in the day when they paired up again, as due to late running it was dark! 37603 leads the Pathfinder Tours 1Z87 09:45 Euston to Folkestone Harbour 'Atomic Harbour Master' railtour down the steeply graded Folkestone Harbour branch on 20 October 2007. It is just about to pass over the well used footpath crossing between the Tram Road and Dudley Road. As can be seen from the rusty rails, only one line is used, and the third rail supply was turned off years ago. A cautious descent of this 1 in 30 gradient is required, as the branch ends at the Harbour Station, after a sharp bend, so brake failure is not to be contemplated! 37603 catches the last rays of the setting sun as it passes Snargate, on the Dungeness Branch with the Pathfinder Tours 'Atomic Harbour Master' railtour on 20 October 2007, at this point running as the 1Z89 15:42 Dungeness to Crewe, although running an hour late. This late running meant there was no chance of the hoped for picture of both locos back in multiple after the Ashford run round. 37601 was on the rear at this point. 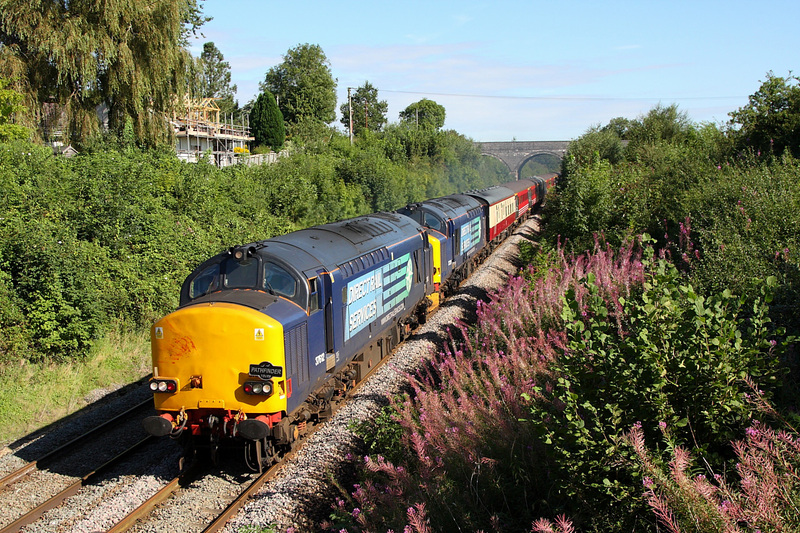 37603 & 37601 Class 37-'Fifty' pass Haresfield on 29 August 2014 with the Pathfinder Tours 1Z29 06:14 Crewe to Kingswear 'Dartmouth Flyer' railtour. I have already seen this combination of locos (albeit in a different liver) on two other Pathfinder tours, in 1996 & 2007. 37604 & 37611 race through Hagley station on 1 June 1996 with the Pathfinder Tours 1Z37 05:50 Bristol Temple Meads to Carnforth 'Cumbrian Coaster' railtour. The European Passenger Services 37/6s were a very popular choice for railtours at the time, with another pair being used by the same tour operator just a few weeks later. On a typically dull Scottish day, with the mountains in the background disappearing into the cloud, 37604 sweeps round the reverse curves on Rannoch Moor as it approaches the remote Rannoch station with the 7D54 11:58 Fort William Alcan Works to Coatbridge aluminum ingots on 4 September 2000. There aren't many places on the rail network where you can take a picture like this with the track snaking in both directions directly above the locomotive! 37604, 37603 & 47805 power through Goole with the Pathfinder Tours 1Z38 13:14 York to York (via Hull) 'Ouse-Humberman' railtour on 7 May 2007. This was a mini-tour in connection with the main Southampton to York railtour. There was a lucky patch of sun at Goole as 37604, 37603 & 47805 returned from Hull with the Pathfinder Tours 1Z38 13:14 York to York 'Ouse-Humberman' railtour on 7 May 2007. The tour is pictured weaving across onto the Knottingley line at Potters Grange Junction, with Goole's landmark water towers in the background. Unfortunately the lighting was virtually head on, but at least it wasn't raining as it had been earlier on! This was a mini-tour in connection with the main Southampton to York railtour. 37604 passes Bredicot on 18 June 2015 with the 3Z07 14:29 Derby RTC to Alexandra Dock Junction Network Rail test train. An interesting train, but almost getting commonplace now. I still much prefer this loco in its previous incarnation, in tatty EPS livery, at work in Scotland. 37605 approaches Heyford in the rain on 16 August 2001 with the 4S59 15:13 Millbrook to Coatbridge freightliner. At this time Freightliner had a motive power shortage, and so hired in former EPS Class 37/6s to work some trains. Unfortunately this seemed to correspond with a period of very bad weather! 37605 brings up the rear of the 4Z10 11:08 Gloucester to Derby Network Rail measurement train at Bredon on 7 January 2006. 37611 is the leading locomotive. The weather was terrible, but at least it wasn't snowing, which apparently it was a little further to the north. DRS 37605 approaches Charlbury at some considerable speed with the 1Z14 09:45 Derby Railway Technical Centre to Worcester Shrub Hill (via Oxford) Ultrasonic Test Train on 11 September 2006, with classmate 37602 on the rear. The Cotswold Line possesses several long sections of single track, this 14 mile section from Ascott-under-Wychwood to Wolvercote Junction is particularly inconvenient when there is any late running. From a photographic point of view however, it can be a bonus, as I was able to easily get this picture, after seeing the train earlier at Shipton, as it was held at Ascott-under-Wychwood for the 13:25 Oxford to Worcester Shrub Hill to clear the section. DRS 37605 races through Shipton station, on the Cotswold Line with the 1Z14 09:45 Derby Railway Technical Centre to Worcester Shrub Hill (via Oxford) Ultrasonic Test Train on 11 September 2006. Very few loco hauled trains use this route, as there is no regular freight traffic. Only a few trains serve this station, and prospective passengers should make sure they park on the correct side, as the boarded foot crossing that was situated at this end of the platforms has been removed, necessitating a lengthy walk via the road bridge to change platforms. 37605 & 37602 pass Kennington on 27 November 2015 with the 5Z37 10:11 Eastleigh to Derby ECS, prior to working the following day's Pathfinder Tours 1Z47 06:18 Derby to Chichester 'Jolly Marketeer' railtour. The locos worked down from Crewe the previous day light engine. They are slowing down on the approach to Kennington Goods Loop, where the train was held for half an hour. This kind of long distance empty stock working is a symptom of today's impoverished and privatised railway, and is certainly not very environmentally friendly, when the locos effectively cover three times more mileage than is strictly necessary. All because the locos, stock and start point are all in different places! Note the steel piles for the massively delayed electrification project. The 6M63 11:58 Bridgwater to Crewe nuclear flask passes Up Hatherley on 20 October 2016, unusually running in top'n'tail mode. 37605 & 37603 sandwich the single flask. This was another day when it only seemed to be sunny when I was either at home, or in the car! 37606 arrives at Garelochhead on 23 July 1999 with the 7D54 11:58 Fort William to Coatbridge aluminium ingots. As I had been listening on the scanner for its approach, I knew exactly what would happen next. The driver had reported that the RETB token apparatus in the leading cab was not working, and had gone to the rear cab to use the equipment there during the token exchange at Tarbet. As I expected, exactly the same procedure was about to take place here. Under leaden skies, 37606 & 37423 race through Ashchurch station with the Spitfire Railtours 1Z37 06:44 Crewe to Paignton 'Paignton Pudden' railtour on 21 June 2008. The weather forecast had predicted heavy rain, which would normally have deterred me from venturing out for this tour, even with Class 37 haulage. However, as DRS tractors were involved rather than the ubiquitous EWS locos, I decided to go for what I expected to be picture taken in torrential rain. In the event there was just a very slight drizzle when the train came, although as can be seen from the track it had been raining earlier. It was however very dark! Note the line curving away to the right into the MoD depot. 37606 & 37609 approach Wolvercote Junction on 24 July 2016 with the 5Z14 14:32 Eastleigh to Burton-on-Trent Wetmore Sidings ECS. This was the stock used on the previous day's Pathfinder Tours 'Cheshire Cat' railtour. I hadn't looked over this side of the A40 bridge for many years, and although I knew it was getting very overgrown, I couldn't believe just how bad it has now become. There is now no possibility whatsoever of my favourite evening viewpoint from the 1990s, with totally out of control bushes growing right up to the lineside. Even this view from east side of the line is very restricted. Network Rail have only got themselves to blame for leaves on the line during the autumn, as most of it is due to their total neglect of the lineside. 37607 speeds past Banbury Stone Terminal with the 1Z12 08:30 Derby RTC to Bristol Kingsland Road Network Rail test train on 21 September 2009. As is often the case with these workings, this was running 15 minutes early. In view of this I had taken the precaution of arriving in plenty of time! 37608 can just be seen on the rear of the train. There was very little sign of activity in the stone depot, presumably due to the recession suppressing the demand for building aggregates. 37607 & 37611 make light work of the 1Q12 08:55 Derby RTC to Bristol Temple Meads radio test train on 12 September 2010, seen here passing Langley Burrell. I had seen it a little earlier at Sapperton, and due to the train having to negotiate the single track section between Kemble and Swindon and then reverse at Swindon, there was easily enough time to get to this second location. This was despite having to crawl at walking pace through the village of Langley Burrell as there was a marathon race taking place! 37607 leads the 1Q13 10:02 Bristol Temple Meads to Bristol Temple Meads (via Newport, Gloucester and Newport again!) Network Rail Radio Survey Train past Minsterworth on 6 April 2011, with 37611 on the rear. What I presume is a wild pear tree provides a convenient foreground frame to the picture. Note the typical wispy high cloud associated with settled high pressure. 37607 speeds past the site of Wootton Bassett station on 8 April 2011 with the 1Q13 09:08 Bristol Temple Meads to Derby RTC Network Rail Radio Survey Train. 37611 is on the rear of the train. This was supposed to be the first of a series of pictures I would take of this train during the day, but in the event severe technical problems with 37611 saw its itinerary effectively curtailed a few miles up the line at Swindon. The junction in the background is where the Badminton 'cut off' route swings in from the right to join the original Great Western Mainline. How's this for an unusual headboard! The 'Dead Pigeon Express' passes Wolvercote on 2 September 2011, led by 37607 & 37608, with 47841 out of sight on the rear. This is actually of course the Cruise Saver Express 1Z59 05:45 Glasgow to Southampton Eastern Docks private charter, which has picked up its unautorised passenger en-route. It is obviously a northern pigeon, as it was already hitching a ride near Preston! As I had photographed this train at this location exactly one month before, I thought I would re-use the location, in view of the different traction. I rightly guessed that although the shadows would be lengthening after a month, the fact that it was booked to pass thirty minutes earlier would compensate. In the event it was running ten minutes late. With a fanfare of horns, 37607 & 37602 pass through Glen Falloch on 24 June 2013 with the Compass Tours 1Z33 04:11 Crewe to Oban 'Oban & Lorn Highlander' railtour. Although only a short distance from the main road, this entailed an extremely muddy and circuitous walk! The location was chosen, as the 6E45 Fort William to North Blyth alumina empties was due from the other direction shortly afterwards, and this location gives a clear view in either direction. 37607 & 37612 approach Standish Junction on 8 July 2015 with the Pathfinder Tours 1Z40 06:12 Bristol Parkway to Dereham 'Norfolk Explorer' railtour. The 37s were a last minute replacement for the unavailable booked Class 20s. Although this location gives the impression of a four track mainline, it is in fact just a half mile section where the Bristol to Gloucester former LMS route runs side by side with the former GWR route from Swindon to Gloucester. 37607 pushes the early running 3Q64 10:20 Canton Pullmans to Canton Pullmans (Via Swindon) Network Rail test train towards Kemble Tunnel on 3 January 2019. DBSO 9708 is at the front of the train. Kemble Tunnel is only 409 yards long, and as can be seen by the lack of any real hill, was only constructed to hide the line from the original Kemble estate owner's house. 37607 passes through Kemble station for the second time on 3 January 2019 with the 3Q64 10:20 Canton Pullmans to Canton Pullmans Network Rail test train. This was running 35 minutes early, having just reversed at Swindon. Why it was not held at Swindon until the booked time is a mystery, especially as it delayed the following 1G38 13:36 Paddington to Cheltenham Spa HST to such an extent that it had to be terminated at Gloucester! 37608 & 37607 pass Normanton on 30 August 1997 with the 4O31 15:16 Leeds to Southampton freightliner. For a brief period during 1997 this train was booked for haulage by a pair of DRS Class 37s, which at the time meant these hastily rebranded ex European Passenger Services locos. 37608 passes Normanton in superb autumnal evening light with the late running 4O31 15:16 Leeds to Southampton freightliner on 18 October 1997. At the time this working was booked for a pair of the ex European Passenger Services (EPS) Class 37s that had recently been acquired by Direct Rail Services (DRS), but on this day a single locomotive had been rostered. Pending a full repaint the loco carries the former EPS livery with DRS branding. I was extremely glad that the train wasn't any later, as the shadows would very soon have become a nuisance. In fact I had already moved from my previous location at Wakefield because that spot had been become useless for photography because of the lengthening shadows. The hawthorn is in full bloom at Conwy on 20 May 2000, as 37608 & 37612 accelerate away from the town in the rain with the 1Z11 13:18 Blaenau Ffestiniog to Crewe Railway Magazine special. 37029 & 37379 are out of sight on the rear of the train, and these would be heading the train back to Crewe after its reversal at Holyhead. DRS 37608 races through Pilning station with the 1Z94 15:00 Swansea to Derby Network Rail New Measurement Train on 8 September 2006. Classmate 37611 was on the rear. An hour previously I had witnessed a solitary passenger alight from the only down train booked to stop at this station. To say this station is little used is an understatement, and there are persistent rumours of its closure. A far cry from steam days when you could load your car onto a train here to travel to Wales via the tunnel long before the opening of the road bridge. In fact, the end loading bay is still in existence, and I used it as a car park on this occasion! A location which I have meaning to use for some time, but unfortunately in slightly mistier conditions than I would have liked. 37608 & 37069 have just passed Standish Junction on 6 April 2012 with the Pathfinder Tours 1Z26 05:16 Exeter St Davids to Penrith 'Easter Chieftain' railtour, part of a four day land cruise to Oban and Stranraer. The sun had only just risen sufficiently to light the fields in the foreground, as Haresfield Beacon on which I am standing was casting a huge shadow! At least St Nicholas's church at Standish stands out well in the early morning light. Making a fantastic racket that could be heard for several minutes before they came into view, 37608 & 37601 Class 37-'Fifty' storm past Steeple Aston on 2 May 2012 with the Cruise Saver Express 1Z75 05:51 Edinburgh to Southampton Docks boat train. After the previous week's fiasco, when the failure of both 47841 & 47818 resulted in the train being over four hours late, DRS obviously thought that a pair of 37s would be a better bet to actually get the train to the ship on time! 47810 is out of sight on the rear of the train, to act as a draw back loco at the docks, and to provide ETS. I usually walk to this remote location from the village of Lower Heyford, but on this occasion, purely on a whim, I decided to park the car in Steeple Aston and take the footpath from there. This turned out to be an excellent move, as the fields between Lower Heyford and the railway were flooded, after several days of heavy rain. The local farmer told me that it was over two feet deep in places! 37608 passes Chilson on 13 July 2016 with the 1Z78 06:45 Tyseley to Bristol Temple Meads Network Rail test train. 37611 is on the rear. Both locos had been acquired by Europhoenix in March, as part of a job lot of five Class 37s from DRS. The DRS decals have been removed, to be replaced by a very small Europhoenix logo on one cabside. 37608 passes Wantage Road on 13 July 2016 with the 1Z78 06:45 Tyseley to Bristol Temple Meads Network Rail test train, with 37611 on the rear. Both locos had recently been acquired by Europhoenix from DRS. The Europhoenix logo can be seen just above the number on 37608, and its not too hard to see where the DRS logo has been removed from rear half of the bodyside. Running over 40 minutes late, 37608 Andromeda leads the 1Z23 07:14 Bristol High Level Siding to Tyseley Network Rail test train past the site of Ashbury Crossing, near Shrivenham, on 15 June 2017, with 37611 Pegasus bringing up the rear. In absolutely atrocious light, and pouring rain, 37609 & 37610 sweep round the curve at Lowgill on 26 July 1997 with the 6Z58 12:53 Penrith to Cricklewood 'Milkliner'. Both locos had recently been taken over by DRS, who had quickly applied their logos, along with small 'Tankliner' markings midway along the bodyside. Unlike today's everyday use of very fast ISO speeds, this was taken on Fujichrome 100, hence the use of my Canon FD 50mm lens's maximum aperture of f1.4. The rarity of the working justifies this picture's inclusion, despite the poor quality. On 1 August 1998, visiting DRS 37609 is paired with the Keighley & Worth Valley Railway's resident Class 20 D8031, on the 17:00 Oxenhope to Keighley service, seen here at what is known locally as Top Field, between Oxenhope and Haworth, during the line's Diesel Gala. For a short period in 2000, pairs of DRS Class 37s were used on coal trains in south west Scotland. Unfortunately I only managed to get one picture of these workings, and in typically gloomy Scottish weather. However, due to the novelty value of a pair of DRS blue 37s on HAA hoppers, this poor result will have to suffice. The one consolation is that the weather was even worse further north by the look of the dark clouds over the Lowther Hills in the background. 37609 & 37607 pass Cample on 6 September 2000 with the 6M04 14:30 Ayr to Fiddlers Ferry Power Station MGR. Trying to find a location around the Didcot area to photograph the 1Z06 11:54 Derby to Didcot test train on 12 November 2007 was not easy, as with less than an hour's daylight left, virtually every location was shaded to some degree. Surprisingly at Didcot North Junction the footbridge between the industrial and housing estates turned out to be better than the road bridge (seen here in the background), and I was able to get this shot of 37609 (leading) & 37259 with their single coach load as they arrived at their destination. 37609 & 37606 speed past Stanley Downton on 9 June 2012 with the Pathfinder Tours 1Z20 05:37 Crewe to Parkandillack '3-2-C' railtour. Running exactly to time, it unfortunately did not pass me in one of the infrequent sunny spells. However, at least it was brightish, and that Class 150 unit more or less got out of the way! Viewed from the lofty Grintleyhill Bridge, near Combe, 37609 leads the 1Z22 08:14 Tyseley to Bristol High Level Siding Network Rail test train on 20 April 2016, with 37612 on the rear. There has been some recent tree felling near this bridge, which would allow a slightly wider shot (although nothing like what was available in the 1980s). Unfortunately though the trees growing next to the line would then get in the way! I was surprised to be the only photographer at this location, which is undoubtedly one of the most scenic locations on the southern end of the Cotswold Line. Running 15 minutes early, 37609 passes Churchill Heath (near Kingham) on 21 April 2016 with the 1Z23 07:06 Bristol High Level Siding to Tyseley Network Rail test train. Classmate 37612 is on the rear of the train. As the weather was very dull, I chose this location because normally this would be on the wrong side for the sun. When I take pictures of unusual workings in poor light, I always like use locations that would be impossible in better conditions. The blackthorn bush on the right is ideally placed to add a splash of brightness to the picture. 37609 & 37606 pass Up Hatherley on 23 July 2016 with the Pathfinder Tours 1Z10 05:57 Eastleigh to Stockport 'Cheshire Cat' railtour. There is plenty of livery variation here, with the locos in different versions of Direct Rail Services blue, and no less than five different colour schemes in the 13 coach train! 37609 & 37259 pass Wolvercote on 14 April 2017 with the Pathfinder Tours 1Z37 05:12 Eastleigh to Inverness 'Spring Highlander' railtour. This is day one of a four day luxury tour of Scotland. The train could be clearly heard pulling away from Oxford station, nearly two miles away. Directly behind the train is the trackbed of the former down relief line. Network Rail started to reinstate this former wartime line in 2013. The project has since been seemingly abandoned, and the track which had been laid on the new ballast behind the train has been removed! With silver buffers added by 'Special Arrangement', 37610 & 37612 pass Barton-under-Needwood on 16 August 1997 with the 4O31 15:16 Leeds to Southampton freightliner. This was the first occasion that a pair of DRS 37/6s were used on this train, which was intended as a four week trial of DRS traction. The test was obviously successful, as DRS 37s continued on this train for a while, although sometimes with only a single locomotive. 37610 T.S. (Ted) Cassady 14.5.61 - 6.4.08 cautiously descends the Lickey Incline on 12 April 2015 with the Pathfinder Tours 1Z47 08:28 Crewe to Barton-under-Needwood 'Dimple, Darley & Dale' railtour. The 37 would be detached at Bromsgrove, at the foot of the bank, and 20308 & 20305 (just visible on the rear of the train) would then attack the bank from a standing start. After working the Pathfinder Tours 1Z47 08:28 Crewe to Barton-under-Needwood 'Dimple, Darley & Dale' railtour down the Lickey Incline on 12 April 2015, 37610 T.S. (Ted) Cassady 14.5.61 - 6.4.08 was detached at Bromsgrove, and is seen here following the tour back up the bank as the 0Z57 12:14 Bromsgrove Up Goods Loop to Crewe Gresty Bridge. 37610 T.S. (Ted) Cassady 14.5.61 - 6.4.08 & 37059 approach Circourt Bridge, Denchworth, on the up relief line on 22 April 2016 with the Pathfinder Tours 1Z36 05:13 Eastleigh to Carlisle railtour. This was the first day of the four day 'Spring West Highlander' luxury landcruise. The train was booked to stop in the loop for a short while to allow two HSTs to pass. As it was an exceedingly dull morning, I took this picture from the north side of the line, to give a slightly different viewpoint to this well known location. This view also clearly shows the one remaining lineside tree, and the evidence of where its neighbours once were. All part of the plan for the forthcoming but much delayed Great Western Mainline electrification scheme. Just two days after I took this picture the location was completely lost, as a mast, complete with diagonal support was erected in the immediate foreground. It will take forever if they keep adding just one mast each weekend! 37611 & 37604 speed past Brock on 1 June 1996 with the Pathfinder Tours 1Z37 18:10 Carnforth to Bristol Temple Meads 'Cumbrian Coaster' railtour. The names gives a clue to the main destination of the train, where not only was the weather better, but the traction was even more unusual - three Class 20s, with the leading one running bonnet first! In abysmal light, 37611 leads the 4Z10 11:08 Gloucester to Derby Network Rail measurement train past the site of Bredon station on 7 January 2006. 37605 can be seen on the rear of the train. Bredon station (between Cheltenham and Worcester), along with neighbouring Defford and Eckington closed in January 1965. 37611 & 37607 pass Sapperton with a single Network Rail radio test coach on 12 September 2010, whilst working the 1Q12 08:55 Derby RTC to Bristol Temple Meads. Even with this featherweight load the distinctive English Electric racket could be heard long before it came into sight, proving just how steep the gradient is at this point. As the train was running 15 minutes early, and would have to be held at Kemble until a down passenger train cleared the single line section to Swindon, there was easily enough time to get a second shot at Langley Burrell. This was despite the fact that it was a fair walk back to the car from this spot up a very steep and heavily overgrown footpath. After already having visited Newport once earlier in the day, the Network Rail Radio Survey Train heads back to Wales on 6 April 2011 with the 1Q13 10:02 Bristol Temple Meads to Bristol Temple Meads (via everywhere), seen here passing Churcham. An exceedingly grubby 37611 is leading, with 37607 on the rear. Just visible in the distance on the left is the spire of Highnam church. Definitely worth stopping, looking and listening! 37611 & 37069 sandwich track inspection coach 999508 as they pass Culham with the 2Q88 08:20 Didcot to Banbury test train on 27 April 2011. Routed via Severn Tunnel Junction and then back to Didcot, the train had passed this spot a little earlier en-route to Oxford. This is the Oxford to Didcot return, shortly to be followed by another run in the opposite direction, through Oxford to Banbury, where it would stable in readiness for the following day's trip to Derby RTC. 37611 passes the abundant hawthorn blossom at Bourton on 26 May 2012, as it speeds eastwards with the 1Q13 09:30 Exeter Riverside to Didcot Network Rail radio survey train, running exactly to time. Classmate 37601 Class 37-'Fifty' brings up the rear. 37611 passes Compton Beauchamp on 14 July 2016 with the 1Z78 06:48 Bristol Temple Meads to Tyseley Network Rail test train, with 37608 bringing up the rear. Note that one of the horns at each end is painted red. I decided to forgo a second picture of this train on the Cotswold Line, as virtually every location would be extremely backlit. Either that, or it would be cloudy, as the Met Office had forecast cloud to build up by mid morning. It was already starting to happen, as can be seen in the background. 37611 brings up the rear of the 1Z23 07:40 Bristol High Level Siding to Tyseley Network Rail test train at Kingham on 26 January 2017. 37601 is the lead locomotive. This view clearly shows how popular Kingham station now is, certainly compared with the 1980s. This is only a section of the virtually full car park. 37611 Pegasus approaches Combe on 14 June 2017 with the 1Z22 08:14 Tyseley to Bristol High Level Siding Network Rail test train. 37608 Andromeda is on the rear of the train. This is my first picture of a pair of Europhoenix livered 37s working a test train, although I have seen this same pair working a similar train in unbranded blue livery. 37611 Pegasus brings up the rear of the 1Z23 07:14 Bristol High Level Siding to Tyseley Network Rail test train at the site of Ashbury Crossing, Shrivenham, on 15 June 2017. Partly hidden by Network Rail's anti-photographer device, 37608 Andromeda can be seen at the head of the train. 37611 Pegasus passes Whitehill (on the single track section of the Cotswold Line between Wolvercote Junction and Charlbury) with the 1Z23 07:14 Bristol High Level Siding to Tyseley Network Rail test train on 15 June 2017. 37608 Andromeda is on the rear. 37611 Pegasus passes Badsey on 4 August 2018 with the 5Q95 13:30 Long Marston to Northampton EMD, conveying EMU 350233, fresh from bodywork repairs. Little & Badsey station (which closed in 1966) was situated by the level crossing in the background. 37611 Pegasus brings up the rear of the late running 5Q42 09:39 Portbury Automotive Terminal to Crewe ECS, as it speeds through Cam & Dursley station on 26 March 2019, conveying brand new plastic wrapped TransPennine EMU 397004. 47815 Lost Boys 68-88 & 47813 Jack Frost are at the front of the train. A Voyager had just sped through the station in the opposite direction, but luckily managed to avoid getting in the way of either this picture, or the Class 47s, despite them being only nine seconds apart! With a bizarre mixed rake of stock, 37612 & 37259 approach Radley on 31 August 2012 with the Pathfinder Tours 1Z37 06:02 Tame Bridge Parkway to Kingswear 'Dartmouth Flyer' railtour. The re-skinned nose of 37612 has certainly not improved the look of the front end, and is definitely not very smooth, with the early morning light showing up numerous ripples and dents. However, this was obviously not helped by what happened later on. Somewhere between here and Swindon, 37612 managed to hit a large bird (my money is on one of the notoriously stupid Wood Pigeons! ), resulting in some more colour being added to the front end. 37612 passes the site of Ashbury Crossing, Shrivenham, on 20 April 2016 with the 1Z22 08:14 Tyseley to Bristol High Level Siding Network Rail test train. 37609 is the rear loco. This train had just traversed the Cotswold Line, and then reversed at Reading. It was booked to go to Weymouth, but only got as far as Westbury, before heading for Bristol. A featherweight load of just three OTA timber wagons is no effort at all for 37667 Meldon Quarry Centenary. This not very cost effective train is the 6B99 04:56 St Blazey to Newport Alexandra Dock Junction Enterprise service. It is pictured passing the site of Malago Vale Carriage Sidings, on the edge of Bristol, on 9 May 1998. 37667 Meldon Quarry Centenary hardly has the most appropriate name for this Scottish working. It is paired with 37520 on 8 August 2000, working the 7D60 15:00 Fort William to Mossend Enterprise, seen here accelerating away from Tulloch. With two locomotives on such a featherweight load the acceleration ought to be quite rapid! 37667 Meldon Quarry Centenary passes Yarnton (near Oxford) on 2 June 2004 with the 18:28 Didcot to Bescot departmental working, following right behind 37174 on the 6M65 18:16 Didcot to Carlisle Enterprise service. Both these trains were booked for Class 66 haulage but would often turn up whatever Didcot wanted to be rid of! To get both Class 37 hauled as late as 2004 was definitely unusual and all the more impressive to get both in sunshine! Watched by a gallery of well over thirty photographers, 37667 & 37510 round the curve on the approach to Wellingborough at Kangaroo Spinney with the 6Z70 10:14 Sheerness to Stockton scrap empties on 23 April 2010. Perfect lighting was helped by a little late running, which made sure the sun was fully on the nose. 37667 passes Frisby-on-the-Wreake on 2 April 2013 with the 1Z23 10:50 Derby RTC to Cambridge T&RSMD. Track recording coach 977974 and 97304 John Tiley make up the diminutive train. The bridge in the background carries the line over the River Wreake, which of course explains the latter part of the nearby village's name. The first part has nothing to do with flying discs! 37667 passes Combe on 2 March 2016 with the 3Q13 08:42 Derby RTC to Kings Norton (via Oxford) Network Rail test train. For a long time this location has been totally obscured by trees, so I was keen to visit the spot after Network Rail kindly removed all the trees along this section of embankment. An infrequent Cotswold Line test train, and a sunny spring afternoon seemed the ideal opportunity. Unfortunately the sunshine only lasted until just after I had made the long walk from the car. Whilst waiting I was subjected to ferociously strong winds and a massive hail storm! This had just cleared when the train arrived, but the lighting was still grim, only brightening up again (temporarily) when I got back to the car! 37668 pulls away from Parkandillack with the morning china clay trip working to Carne Point on 21 April 1998. The train was visible across the fields for some distance as I approached and I was a little concerned that it would depart before I got to the bridge, which after a long drive from Oxfordshire would not have been very amusing! However, all was well and I had a while to wait while the loco did a spot of shunting. And before anyone asks, I had nothing to do with the recently felled tree on the left! After seeing 37668 leave Parkandillack with the china clay trip working to Carne Point on 21 April 1998, a quick dash was made round the corner to the bridge at Treviscoe, where this picture of the train passing the English China Clay Kernick Dries was taken. Classic traction, interesting train, but unfortunately miserable weather! 37668 rejoins the Cornish Mainline at Burngullow on 21 April 1998 with the morning Parkandillack to Carne Point china clay trip working. I had already photographed this at Parkandillack and Treviscoe, but couldn't resist another picture. A sight to gladden the heart of any classic diesel enthusiast, but it can only be guessed what the highly conservative steam enthusiasts thought! GWR Hall class 4-6-0 4936 Kinlet Hall's inaugural main line run did not go at all well on 17 June 2000 and diesel assistance was required for the return working from Didcot. The Vintage Trains Birmingham Snow Hill to Didcot 'SLS Special' railtour had traveled outward via Cheltenham and was due to return via Banbury. However, leaking tubes and injector troubles to say nothing of a hot axlebox on the tender resulted in 37668 being added at Didcot. This unusual combination is pictured approaching Wolvercote Junction with the 17:20 Didcot to Birmingham Snow Hill return. 37669 is just about to pass underneath the Tamar Bridge on 26 September 1993 as it passes the Royal Naval Armaments Depot at Ernesettle with the British Rail InterCity 1Z37 11:45 Bere Alston to Plymouth 'Royal Duchy' railtour. Just visible on the rear of the train near the roadway leading to the landing stage is 37413, which had led the outward leg of the tour. 37669 runs alongside the East Looe River near Terras Bridge (between Looe and Sandplace) on 3 May 1998 with the Pathfinder Tours 1Z39 18:15 Looe to Cardiff Central 'Cornish Gnome' railtour. 37403 Ben Cruachan is bringing up the rear. 37669 negotiates the reverse curves at Trerulefoot on 3 May 1998 with the Pathfinder Tours 1Z39 18:15 Looe to Cardiff Central 'Cornish Gnome' railtour. Not a very inspired location, but one that did allow a fully lit view of 37403 Ben Cruachan on the rear of the train. 22 July 1995 marked the final booked use of a pair of Class 37s on the famous Burngullow to Irvine 'Silver Bullet' china clay tanks (although they are obviously not quite so silver by this date!). With appropriate headboard, which reads: 'Last Silver Bullet Syphons', 37670 St Blazey T&RS Depot & 37669 pass Pilning with the 6B68 09:40 Burngullow to Alexandra Dock Junction. The train would work forward to Scotland the following day with 60037 as the 6S55 17:00 Alexandra Dock to Irvine. 37670 St Blazey T&RS Depot & 37696 emerge from Hillfield Tunnel, and approach Gaer Junction on 11 September 1997 with the 6B99 04:56 St Blazey to Alexandra Dock Enterprise service. Despite the rural appearance, this location is surrounded by houses on the edge of Newport. Consecutively numbered 37671 Tre Pol and Pen & 37672 Freight Transport Association run slowly along the down relief line at Pilning on 17 March 1994 with the 6S55 09:40 Burngullow to Irvine china clay tanks. I was very lucky with the sun here, as can be seen by the very dark background. By this date the wagons on this train no longer really warranted their 'Silver Bullets' nickname, although it wouldn't be long before there was no hint of silver at all. 37671 Tre Pol and Pen & 37668 speed past Defford on 23 July 1994 with the 6V70 08:20 Bescot to St Blazey china clay empties. A pair of relatively clean 37s in two different Trainload sector liveries in perfect early morning sunshine. Things didn't get much better than that in the mid 1990s! 37671 Tre Pol and Pen was an appropriate choice of visiting locomotive for the Bodmin & Wenford Railway's Diesel Gala on 23 September 1995. Unfortunately when the 14:00 train from Bodmin General left for Bodmin Parkway, the lighting was terrible, but a few minutes earlier, when the loco was backing onto the train, the sun was shining. At least this picture also gives an uninterrupted view of the station. The line on the left leads to Boscarne Junction. 37671 Tre Pol and Pen is pictured in its home county on 30 March 1996 as it crosses Tregoss Moor with the Pathfinder Tours 1Z37 08:15 Cardiff Central to Newquay 'Cornish Raider' railtour. Classmate 37412 can just be seen on the rear of the train. A passing local recommended this viewpoint and as it was only a short distance from the road I thought there would be no problem. Unfortunately it was the most difficult few hundred yards of walking I have ever undertaken! The gorse bushes were growing on a mix of springy heather and very deep water filled gullies. 37671 Tre Pol and Pen brings up the rear of the Pathfinder Tours 1Z37 16:15 Newquay to Cardiff Central 'Cornish Raider' railtour, as it passes through the diminutive station at Bugle on 30 March 1996. If it looks like a completely cloudless day, just look what the view in the other direction was like! Visiting Railfreight Distribution 37673 passes Waterside Caravan Park at Goodrington on the Paignton & Dartmouth Railway with the 11:00 Paignton to Kingswear service on 20 June 1993, during the line's Diesel Gala. A slightly odd combination of traction and rolling stock! 37673 & 37412 thrash past Claydon (near Ashchurch) with the 6V70 08:20 Bescot to St Blazey china clay empties on 7 August 1993, running early as usual. Claydon is a good photographic location with clear views in both directions, except for these high voltage electricity poles which slightly spoil the southbound shot. The choice is either a long lens to get underneath them, or when you know the train is going to be double headed and a more side view is required (as here), use a standard lens and include them in the picture! Two locos, two wagons! 37673 & 37679 pass Flax Bourton on 30 January 1997 with the 6C20 13:45 Newport Alexandra Dock Junction to St Blazey Enterprise service. This train was often quite short, but this is taking things to the extreme! 37673 & 37674 Saint Blaise Church 1445-1995 pass Brent Knoll on 28 June 1997 with the 6B99 04:09 St Blazey to Newport Alexandra Dock Junction Enterprise mixed freight service. The leading HEA ex coal hoppers are conveying calcified seaweed. This was harvested from the seabed in the Falmouth area until 2004, when its removal was banned on ecological grounds. On 7 December 1988 I travelled down to the West Country specifically to photograph 50149 on the 10:45 Heathfield to St Blazey trip freight. As it had been a very reliable performer on the working for several weeks, I was not very impressed when 37674 turned up instead (pictured here rounding the curve at Aller). Of course the intervening years have changed my mind slightly! 37674 & 37670 cross the River Avon at Eckington on 17 October 1992 with the 6V70 08:20 Bescot to St Blazey china clay empties. Not quite perfect framing here, with the train just a little too far forward. However, even if I had the luxury of ten frames per second in those days (which I don't think anyone had! ), the chances of getting this exactly right, with such a narrow gap would be extremely small. A sadly missed train, and although I have got quite a few pictures of it, considering it ran on a Saturday morning, I should, with hindsight, have taken a lot more! Even without the station nameboard, this could really only be one place! China clay wagons and palm trees give away the location as Lostwithiel. 37674 Saint Blaise Church 1445-1995 passes through the station on 21 April 1998 with another load of china clay for export via the docks at Carne Point, at the end of the Fowey branch. 37674 Saint Blaise Church 1445-1995 & 37375 approach Wolvercote Junction on 13 August 2003 with the 6M28 18:23 Didcot to Bescot departmental working. This train was already booked for Class 66 haulage, so to get a 37 on it was by this time getting less likely. To get a pair was definitely a bonus, although unfortunately the weather wasn't playing ball. Luckily the train is moving so slowly at this point that 1/250sec shutter speed was all that was needed. 37675 William Cookworthy & 37673 pass the boarded up signal box at Exminster on 22 April 1988 with the 6B43 15:35 St Blazey to Gloucester Speedlink service. Although only a short train, this true mixed traffic working contains an amazing seven different types of wagon. Both locos were allocated to Laira at the time and were regularly paired on this working. Nowadays in the health and safety obsessed age the lead locomotive would probably be failed for having a non working headlight! 37675 Margam TMD & 36670 St. Blazey T&RS Depot pass Bredicot on 5 June 2004 with the Pathfinder Tours 1Z37 05:54 Westbury to York 'White Rose Express' railtour. A dull grey midsummer morning, but then this location would have been totally impossible, had the sun been out. 37675 Margam TMD & 36670 St. Blazey T&RS Depot pass Treeton Junction on 5 June 2004 with the Pathfinder Tours 1Z37 05:54 Westbury to York 'White Rose Express' railtour. I never did get around to visiting this location when there were semaphore signals and an extensive network of tracks. This overgrown semi-derelict scene is a sad comment on the decline of rail. 37676 approaches the site of Coalpit Heath station with the 6V14 07:30 Hull Saltend to Baglan Bay acetic acid on 23 April 1998. Unfortunately not a technically very brilliant picture as it was taken on a very dull day. However, this view is only possible on such a dull day as it is taken from the north side of the line. 6 November 2011 saw the rare appearance of a pair of Class 37s on the Cotswold Line. 37676 Loch Rannoch & 37685 Loch Arkaig worked the Spitfire Railtours 1Z27 10:30 Exeter to Preston 'Jorvic Explorer III' railtour, seen here passing Shorthampton. Unfortunately they passed me in the worst of all possible lighting conditions - a dense patch of cloud on a partially sunny day. The awful sludge brown livery that these locos are painted in looks bad enough in good light, but in these conditions it looks terrible. Considerable work in Photoshop has been required even to achieve this barely adequate record shot. Superb late afternoon lighting at Cambois on 30 March 1998, as 37677 growls past Freemans signal box with the 6N58 17:20 North Blyth to Lynemouth alumina train. It had been a completely dull day up until this point and I was surprised to see the sun start to come out just as the train was coming into view. As it was so late in the day it was lucky that nothing was casting a shadow across the picture, as I had no chance to get to an alternative location! This amazing lighting didn't last long, and as can be seen from the dark background was only just sufficient to cover the entire train. The dark brooding clouds over the North Sea in the distance are an indication as to what the rest of the day was like! 37678 & 37417 Highland Region pass Four Oaks (Near Faversham) on 9 August 1997 with the 1O99 08:56 Birmingham New Street to Ramsgate service. This was one of Rail Magazine's 'Ramsgate Day Out' specials, when the magazine organised the replacement of the train's normal Class 47/8 power with more exotic traction. With the terraced houses of Brithdir as a backdrop, 37678 heads down the Rhymney Valley on 26 June 1999 with the 2F09 07:15 Rhymney to Cardiff Central service. A revised timetable was in operation, in connection with the opening of the Millennium Stadium in Cardiff. In connection with the inaugural rugby match at the new Millennium Stadium in Cardiff, the Cardiff Railway Company utilised Class 37 traction on a revised timetable on the Rhymney line on Saturday 26 June 1999. With the last remnants of its Trainload Construction just visible on its bodyside, 37678 heads south from Pontlottyn with the 2F33 13:15 Rhymney to Cardiff Central service. Much building work is in evidence at Southall on 22 June 1991 as 37682 & 37685 pass through the station with the Class 37 Group 1Z21 07:58 Manchester Piccadilly to Brentford Goods 'Brentford Bard' railtour. Luckily the station canopy hides much of the train which is composed of the awful Pilkington liveried Mk1 set which disfigured so many railtours in the early 1990s. 37682 & 37194 are hardly overstretched as they pass Coaley with the 6M67 14:05 Bridgwater to Crewe nuclear flask on 2 August 2010. Notorious for running early, this passed me just a few minutes after the booked departure time! Unfortunately the earlier sunny start to the day had not lasted, and by the time this train appeared the lighting was really grim. 37682 & 37409 Lord Hinton make a fine sight (and sound!) as they pass South Moreton on 8 March 2011 with the 5Z47 07:45 Crewe to Eastleigh ECS. I had originally intended to photograph this just around the corner at Didcot North Junction, but as the train was nearly two hours late leaving Crewe, the lighting would not have been ideal. In the event the 37s managed to claw back some time, being only approximately 90 minutes late at Didcot. Note the variety of liveries in the train! 37685 passes Uffington on 18 September 2010 with the Vintage Trains 1Z57 09:20 Solihull to Plymouth 'Down Devonian' railtour. Although basically a positioning move to get the stock down to the West Country, Vintage Trains commendably sold tickets for the journey, with participants being able to return via First Great Western services. I had deliberately chosen this location, as it is just about the only spot on the Didcot to Swindon line where the sun would be on the nose at the booked time. The train was incidentally running exactly to time at 11:36. 37685 passes Yarnton in the rain on 27 September 2010 with the Vintage Trains 1Z58 09:30 Plymouth to Solihull 'Up Devonian' railtour. Unfortunately the weather was the complete opposite to when the loco took the coaches south just over a week before. However, as I was virtually passing this spot en-route to Oxford anyway, it was well worth standing in the rain for a few minutes. This location is rather restricted with foliage, but a head on shot helps to disguise the West Coast Rail 'sludge brown' livery. It also seems that I only use this spot in terrible weather, as the last time I was here was on an equally wet day for a picture of 66567. Note that the milepost has been replaced since 2008! 37685 & 37676 Loch Rannoch storm past Fiddington on 26 March 2011 with the Spitfire Railtours 1Z41 06:42 Weston-super-Mare to Holyhead 'Holy Oakes' railtour. A miserably dull morning, with mist in the background is definitely not the best conditions in which to photograph a pair of West Coast maroon liveried locos! 57601 in similarly drab livery is on the rear of the train. In the still early morning air the train could easily be heard leaving Cheltenham, over five miles away! 37685 Loch Arkaig brings up the rear of the Royal Scotsman 1Z30 14:59 Bath to Oxford 'Grand Tour of Britain' luxury charter on 12 July 2011. 57001 is at the head of the train. The train is just approaching the site of Wantage Road station (just in front of the bridge), where it is booked to stop for twenty minutes to allow service trains to overtake. Note the tall telecoms tower which now ruins pictures taken from the bridge in the background. 37686 leaves Buxton on 17 September 1994 with the Pathfinder Tours 1T70 'Lancastrian' railtour. The loco had just taken over the tour, and would work as far as to Manchester Piccadilly. The train, which started from Crewe, had the following itinerary: Crewe to Manchester Piccadilly (90149), Manchester Piccadilly to Buxton (56093), Buxton to Manchester Piccadilly (37686), Manchester Piccadilly to Latchford Sidings (20131 & 20128), Latchford Sidings to Liverpool Lime Street (60085 & 60082), Liverpool Lime Street to Kirkby (31188 & 31163), Kirkby to Warrington Bank Quay (47194) & Warrington Bank Quay to Blackpool North (37509). The following day another, equally elaborate tour was run, starting from Blackpool! Viewed from over half a mile away, on the slopes of Great Treffgarne Mountain, 37686 & 37274 approach Treffgarne Gorge with the Pathfinder Tours 1Z33 15:08 Fishguard Harbour to Coventry 'Pembrokeshire Pageant' railtour on 2 August 1997. In the background is the tiny St Margaret's church, near the village of Ford. With Llanwern steelworks in the background, 37686 & 37274 pass Llandevenny on 2 August 1997 with the Pathfinder Tours 1Z33 15:08 Fishguard Harbour to Coventry 'Pembrokeshire Pageant' railtour. After a generally dull day, the sun decides to come out at the last minute, giving a slight glint to the train. Spot the track! 37688 slowly negotiates the undergrowth as it approaches one of the many level crossings on the Dungeness Branch on 12 July 1997 with the Hertfordshire Railtours 1Z92 10:14 Finsbury Park to Dungeness 'Dungeness Pebbledasher' railtour. This location at Brenzett is definitely in need of a visit from the weedkilling train! 37688 brings up the rear of the Hertfordshire Railtours 1Z93 15:10 Dungeness to Finsbury Park 'Dungeness Pebbledasher' railtour at Appledore station on 12 July 1997. The train is accelerating away from the junction with the Dungeness line. In superb lighting, which was only to last another five minutes, 37688 Kingmoor TMD & 37510 pass Wistow Road near Kibworth Harcourt on 3 February 2011 with the 6Z50 09:25 Stockton to Sheerness scrap train. Clouds were already rolling in from the west and I was glad that the train was only running a few minutes late. Note how black it is looking over the Leicester area in the background. Given that this is one of the better locations on the Midland Mainline, I was amazed that I was the only photographer present to witness this spectacle! 37688 Kingmoor TMD passes Cornbury Park, Charlbury, on 18 September 2013 with the 3Z13 08:04 Derby RTC to Stoke Works Junction Network Rail test train. Such was this train's slack schedule (as is the case with most test trains), that it's hour late departure had been converted into a few minutes early running by the time it passed me. The train would return later with DBSO 9714 leading, but with the weather being poor, it wasn't worth hanging around for another picture of the 'wrong' end of the train. 37688 Kingmoor TMD brings up the rear of the 1Z02 06:32 Derby RTC to Bristol (via Weymouth) Network Rail test train at Ascott-under-Wychwood on 23 March 2016. 37601 Class 37-'Fifty' is the lead locomotive. 37688 Kingmoor TMD passes Chilson in the pouring rain on 24 March 2016 with the late running 1Z03 09:37 Bristol Temple Meads to Derby RTC Network Rail test train. This had lost its original path over the Cotswold Line, having arrived at Oxford an hour early, but then departed an hour late! 37601 Class 37-'Fifty' is on the rear of the train. The 1Z03 09:37 Bristol Temple Meads to Derby RTC Network Rail test train lost its path over the Cotswold Line on 24 March 2016, leaving Oxford an hour late, and consequently following right behind the 1W32 12:20 Paddington to Worcester Shrub Hill GWR HST. This lead to it coming to a stand at a red signal at Ascott-under-Wychwood, where it waited for 10 minutes, until the HST cleared the section. 37688 Kingmoor TMD is pictured noisily getting under way again, with classmate 37601 Class 37-'Fifty' just visible on the rear. The ramshackle buildings on the right are on the site of Ascott's former small goods yard. 37689 & 37667 Meldon Quarry Centenary approach Ashchurch on 19 June 2004 with the Pathfinder Tours 1Z33 06:32 Swindon to Holyhead 'North Wales & Snowdonia' railtour. The sidings on which the tamper is residing were also used for MoD traffic to the nearby Army base. 37689 & 37667 Meldon Quarry Centenary pass Hodgehill Farm, Kidderminster on 19 June 2004 with the Pathfinder Tours 1Z33 06:32 Swindon to Holyhead 'North Wales & Snowdonia' railtour. This was a straight out and back train, with the same pair of locos used throughout the day. With the stone terminal on the site of Coaley Junction dominating the background, 37691 & 37800 Glo Cymru pass what is now Cam & Dursley station on 1 July 1990 with the Pathfinder Tours 1Z37 14:50 Birmingham New Street to Bristol Temple Meads railtour, one of a number of specials run in connection with the Gloucester Rail Day. Just 15 minutes earlier, 37235 & 37131 had passed by with a similar tour. 37694 runs along the down relief line at Marshfield on 27 August 1998 with a short ballast train. Just short enough to fit in the gap in the bushes! Even this formerly wide open vista is now affected by uncontrolled lineside vegetation. With the M40 motorway in the background, 37694 & 37521 English China Clays pass the site of Ardley Quarry, on the Chiltern Line with the Pathfinder Tours 1Z71 12:22 Kettering to Crewe 'Metropolis Meanderer' railtour on 9 August 2003. The 37s had taken over from 66703 at Acton Canal Wharf Junction, and earlier in the day 92039 (Crewe to Nuneaton) and 60029 (Nuneaton to Kettering) had worked the 1Z70 outward leg of the tour. This location is not the most pleasant spot to spend time waiting for a train, as a vast area behind where I'm standing is a rubbish filled former quarry. Although it has now been covered with earth and returned to fields, there is the ever present smell of escaping methane! 37696 & 37695 pass Stoke Orchard on 22 July 1995 with the 6V70 08:50 Bescot to St Blazey china clay empties. A sadly missed and much photographed train, not least because it ran on a Saturday morning at a perfect time for the best possible lighting. 37696 & 37672 Freight Transport Association approach Droitwich on 4 November 1995 with the 6V70 08:50 Bescot to St Blazey china clay empties. A fine viewpoint that was slightly spoiled by the junk on the right of the picture. That has now gone, but now the view is totally compromised by the inevitable communications mast. 37698 & 37712 pass underneath the Oxford to Worcester Cotswold Line at Norton on 12 April 2003, as they head northwards with the Pathfinder Tours 1Z37 06:12 Reading to Knowsley Freight Terminal 'Wizard Express' railtour. Photo taken from a public footpath crossing.